Tindering in Tulum – Where is Lydia? One of the things that I love about Tulum is that everyone rides bikes. The town, as well as the beach, are easily accessible by bike. There are a plethora of restaurants to choose from, ranging from fancy five star dining to Thai food to gluten free vegan options to inexpensive Mexican food – definitely something for everyone. Many hostels offer free bike rentals. It’s a good idea to check if the hostel you are staying at offers free bikes, otherwise you can rent them from $70 to $100 MXN (about $3.50 to $5 USD) a day. I always make sure to stay at hostels with free breakfast to save money, and free towels and hot water are always a plus as well. After the beach, I decided to ride into town to explore and look for something to eat. There is a bike path that runs all along the main road. It ends once you reach the downtown area but there is a narrow street next to the side walk you can ride on. Be warned though, cars also drive on this street and cars in Mexico always have the right of way. Figuring out a new town is always fun and exciting but when you’re starving it can be frustrating. All I wanted for dinner was a quesadilla and a sope. Sopes are thick corn tortillas topped with cheese, meat, lettuce, and cream and they’re my favorite. After searching for about a half an hour I ended up finding a place that only sells quesadillas and sopes called Las Quekas. I was in love. The quesadilla was pretty lackluster but the sope was the best I’ve ever had! I highly recommend going here and each one is only $15 MXN (about .75 cents USD). 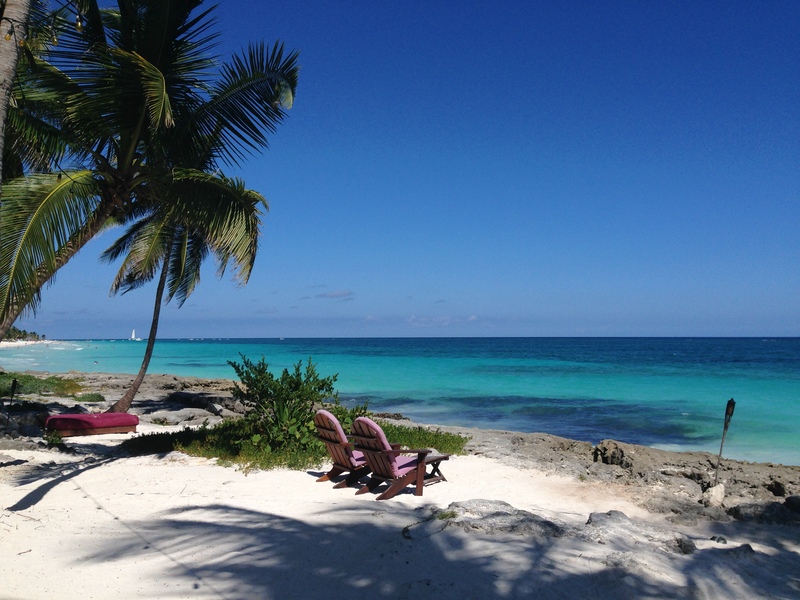 Tulum is extremely tourist friendly and easy to navigate. Their main road is lined with souvenir shops, bars, and restaurants. Many of the bars and restaurants even have live music. Once I find a restaurant I like it’s hard to get me to go anywhere else. My top three choices for Tulum are Las Quekas, El Rincón Chipaneco, and Burrito Amor. After dinner, I didn’t really know what to do with myself. I didn’t want to go back to the hostel because it was still early. There was a huge Christmas tree in the town square blasting Christmas music so in the spirit of Christmas I sat in front of it. I decided to open Tinder and see who was out there. In most of the other cities I had used the app it had been mostly Mexicans but here in Tulum it was all tourists. I matched with a few people and we started talking. Tulum is very small so chances are if someone is in Tulum you are close by. The first person I matched with was Nicolás. He was from Argentina and even “super liked” me. Nicolás was close by so he came to meet me. The whole thing was super weird. I didn’t know it at the time but he had been having dinner with his parents before he left to come meet me. They were staying in Playa del Carmen which is about 30 minutes North of Tulum, and after about 10 minutes he said he had to leave to drive back with them. I guess that’s a good out. So, I went back on the app. I mean, why not? I matched with another guy Edgargo who messaged me and we decided to meet up. Edgargo was from Argentina as well. It seems like most tourists in Tulum are either from Italy or Argentina. I told him he could find me next to the big singing Christmas tree. He pulled up on his bike and suggested we should ride to the beach. It was the night before a full moon and the moon was illuminating everything. Our bikes didn’t have lights and neither did the bike path to the beach but it didn’t matter, everything was illuminated by the moon. When we arrived at the beach, it was truly magical. The white sand on the beach was glowing from the light of the moon. Even the crystal clear blue water was sparkling in the moonlight. We sat on the beach and talked for hours. Edgargo had traveled up from Argentina. When he got to Panama he purchased his bike and rode it all the way to Mexico. He said he would ride 6 to 8 hours a day until he got tired and then would either camp or find a place to stay. He said he wanted to bike all over Europe and Asia next, and also that he wanted to open his own hostel. Before we knew it, it was 1am. I told him it was getting late and we’d better leave. He did the gentlemanly thing and accompanied me by bike back to my hostel. All-in-all it was a good night. I stayed at three hostels while I was in Tulum. Los Lobos had comfortable beds, A/C, great free breakfast, a kitchen you can use, as well as free bike rentals. It’s located on the main road and it’s about a 20-minute bike ride to the town and 10 minutes to the beach. It’s priced at $12 USD a night. La Casona Hotel and Hostel was brand new, very clean, and the dorm rooms were smaller with only 3 beds. Bike rentals were not free but you could rent one from the hostel for $100 MXN per day. Breakfast was very lackluster, only some toast with jam. It was $10 USD a night. Humble Bumble has very comfortable beds, A/C, nice staff, great free breakfast, and free bike rentals. It’s about a 20-minute bike ride outside the town but only about a 10-minute bike ride away from the beach. It was still under construction while I was there and didn’t have the best hostel vibe. It currently isn’t available to book on Hostel World which makes me think it’s still under renovation.